Licensing: ServerPlus Export to .csv options? I have recently upgraded to the ServerPlus eddition of the software. Our end users have wanted to output data to .csv file's. However when you go to File > Export on the end users free Viewer, they are not allowed to change the filter. I'm a bit baffled ...by default the "All" selection is not set and the user can't change it. Can you verify the functionality for me? If this is accurate please, describe why it would be a problem to enable this feature? Thanks for the help. Brian - Just to clarify, are you asking why the free Viewer users can't use the Subset drop down to select different defined/filtered groups of rows, or the Fields drop-down to specify which columns they want to export, or both? I am only looking at the "Data" field. To be more specific the end user can't change this with the ServerPlus version. 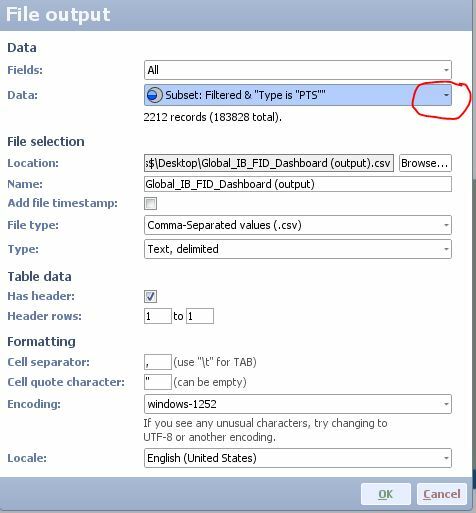 So when you want to output to a .csv you can not change the data set. I would like for the user to be able to change this, or that by detaul "all" data is placed in this field; not a subset. OK, so you are interested in the free Viewer user being able to export different data subsets, i.e. different sets of rows. How many Named Queries are defined in the file, and are the View data subsets in the file set to intersect with user filtering, or 'hard-wired' to always show the rows defined in the Named Queries? There are some reports that have up to 20 queries defined within the report. These queries are used to in conjunction with "Filtered data in" on the charts so that a user could change the rows manually as well. I guess I don't fully understand your question, the queries work great in the full version using the export. I just want the functionality exteneded for ServerPlus free viewer so that the end user can change this. Is that in 2.8? We haven't migrated yet, we were using 2.7b422. Yes, 2.8 b362. Now also in tonight's 2.7 b445.